Unable to contain my excitement, I decided to download the live CD (http://fedoraproject.org/en/get-prerelease) and give it a spin (pun intended). Due to the proprietary nature of my laptop, all the live CD's I have tried so far ( Ubuntu Gutsy, Ubuntu Hardy Alpha, Backtrack3, Fedora Werewolf, Linux Gamers Live) never worked as intended. The only exception is Sabayon, which comes with ATI drivers pre-loaded. I realize that it's not possible to bundle proprietary drivers with the distros, but what I never understood was why they didn't default back to VGA settings and at least run a puny desktop. Anyway, getting back to the topic, Sulphur live CD was a pleasant surprise as it correctly identified my display driver without any intervention. So for the first time since Sabayon, I was able to directly log on to a GUI without having to meddle with xorg.conf and ATI drivers. 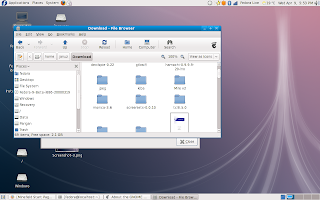 The artwork has not changed since Fedora 8. The boot screens and the logon screens all have the same design as Fedora 8. If the past is any indication, I would expect the final release to have newer and snazzier artwork. But for the time being, Sulphur is almost identical to it's older sibling. The new version of Gnome is working as expected. There are no obvious differences when compared to Gnome 2.20, but I really love the new world clock. Nautilus seems more responsive than usual, even though I am running off a CD. I didn't try to enable the built-in compositing manager, because the default display driver doesn't support direct rendering and frame buffers. 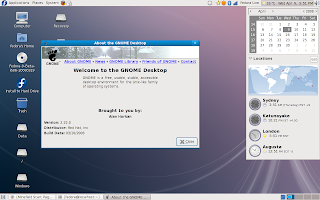 All in all, my first impression of Gnome 2.22 is a very good one. Firefox has never looked this nice ! It's truly a great step forward to have full system integration. Earlier, Firefox was the odd man out as it never followed the system settings. 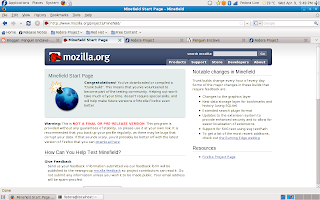 I had to tweak Firefox for hours before it looked decent in Fedora 8, but even then the pages never looked right and fonts always got screwed up. In Fedora 9, Firefox is fully integrated with the system and everything looks great ! Kudos to everyone involved in getting Fedora and Firefox together. Testing ext4 and NTFS resizing will have to wait until I finally install Fedora 9. But so far from what I have seen, Fedora 9 is going to be one of the best releases in the history of the Fedora project. This is not to say that all previous releases of Fedora were crap. But unlike the users of other distros such as Ubuntu, Fedora users always had to pay a price for being on the bleeding edge. Things always didn't work together and required a lot of tweaking. This is probably what keeps many novice users away from Fedora. However now, Fedora is at least stable enough to go mainstream. Hopefully it will open the eyes of all those Ubuntu fanatics who think that Ubuntu is the only Linux distro in the world.